UPDATE, 6:15 p.m.: Cochran has returned to Holzer. According to Sheriff Champlin, earlier this morning his office was notified by Holzer Medical Center on Jackson Pike that a male individual, who had been brought into the facility for a mental health evaluation, walked away from the emergency department. Sheriff Champlin further states that the male has been evaluated and was awaiting transport to a state mental health facility. 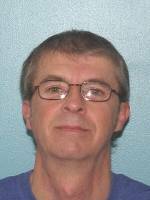 The male has been identified as Jeffrey Cochran, age 53, of Clark Chapel Road in Bidwell, Ohio. Cochran is described as being 6’ tall, weighs 145 pounds with salt and pepper grey hear and green eyes. Mr. Cochran was last seen wearing a grey hooded sweatshirt, blue jeans and was not wearing glasses as seen in this photo. He was last seen on the Holzer campus at approximately 9:40 a.m. If anyone has any information regarding Cochran’s whereabouts, please contact the Gallia County Sheriff’s Office at 740-446-1221 or dial 911.